LANCASTER – The Antelope Valley Transit Authority (AVTA) is joining forces this week with transit agencies nationwide expressing strong opposition to provisions in House bill H.R. 3864, the federal American Energy and Infrastructure Jobs Financing Act. The bill would eliminate dedicated federal fuel taxes for public transit and create long-term uncertainty for public transportation funding for the first time since the Reagan administration. As AVTA struggles to keep up with the demands of increased ridership, this change will have dire consequences for the thousands of people in the Antelope Valley who rely on public transit. Since 1983, nearly half of all public transportation funding has been provided from the federal motor fuels tax dedicated to the Highway Trust Fund. This funding structure has successfully provided highway and transit programs with secure, dedicated revenues and has allowed public transit systems around the country to create jobs and foster economic growth. Under the proposed change, public transit funding would receive a one-time appropriation with no funding for public transportation after 2016. This would create deep uncertainty for AVTA and the thousands of local residents it serves. Public transportation is a proven solution to many of the economic problems facing the United States. For every $1 billion invested, more than 36,000 jobs are created and supported, resulting in nearly $500 million in federal, state, and local tax revenues. According to the American Public Transportation Association, every $1 invested in public transportation generates $4 in economic returns. 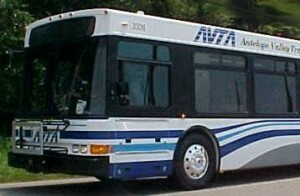 AVTA has been providing public transportation to the Antelope Valley for 20 years. The transit system serves a population of 450,000, covering 100 square miles for local service and 1200 square miles for commuter service. AVTA also provides curb to curb transportation through its Dial-a-Ride program. The transit system is governed under a Joint Powers Agreement between the cities of Palmdale and Lancaster, along with Los Angeles County.